At dusk, accompanied by another friend of his, we walked the three or four kilometers to the camp. From a distance, I could see how massive it was. 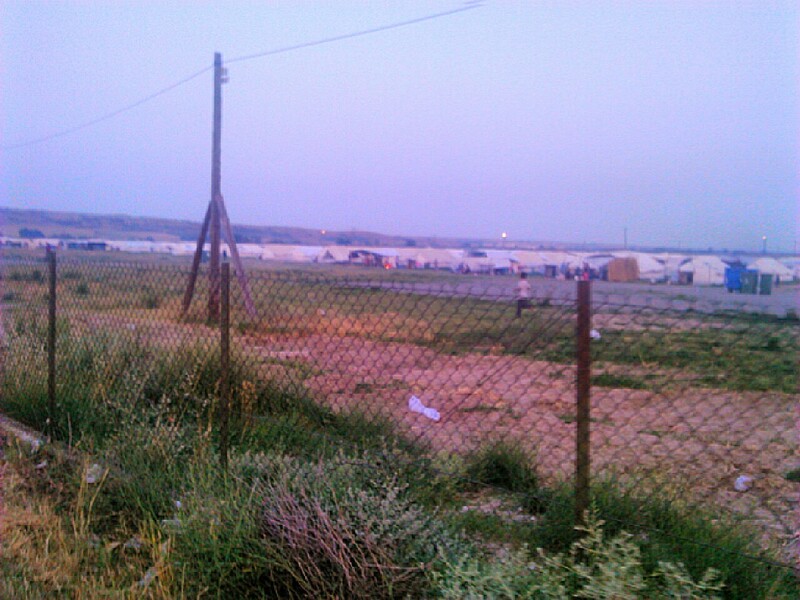 Erected on a decommissioned airfield, the Nea Kavala camp is simply row upon row of identical white tents, showers and toilets spaced out among them. Upwards of 5,000 people live here, Alaa told me. We walked past a sheppard whistling to a herd of shorn sheep in a field. Crops on the other side of us. I imagine the location was found by a team of officers who had calculated the middle of nowhere. We approached the official entrance, trying to pass unnoticed. My escorts flanked me, speaking loudly in Arabic. There were a couple of guards leaning on an army-green truck. Next to them was a large sign showing a camera with a red line through it. They didn’t pay attention to us. We walked in. It was dinnertime and the twilight air was filled with smoke. People here had found ways to supplement the military rations with home-cooked meals. 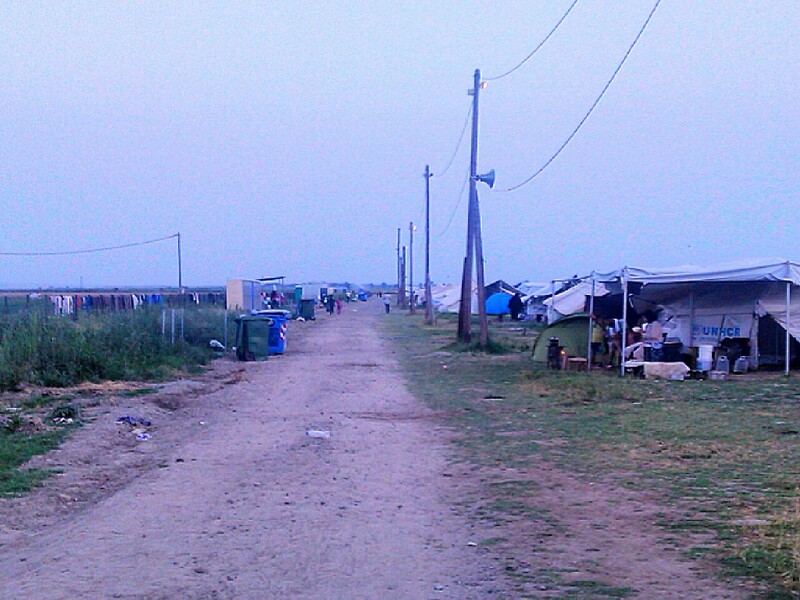 As far as I could see in all directions were identical tents and women, men, and children moving about as anonymous residents of an isolated city. Then we came across something different. A group of guys were standing around a camping tent, a nylon one they had brought in, laughing and shouting. It was a commotion, to be precise. “They make a lake,” explained Alaa, laughing. Indeed, in the middle of one of the roads between tent rows, they had dug down three feet, about six square feet in area. They’d covered the hole with a tarp, and now they were carrying in buckets of water to fill it. 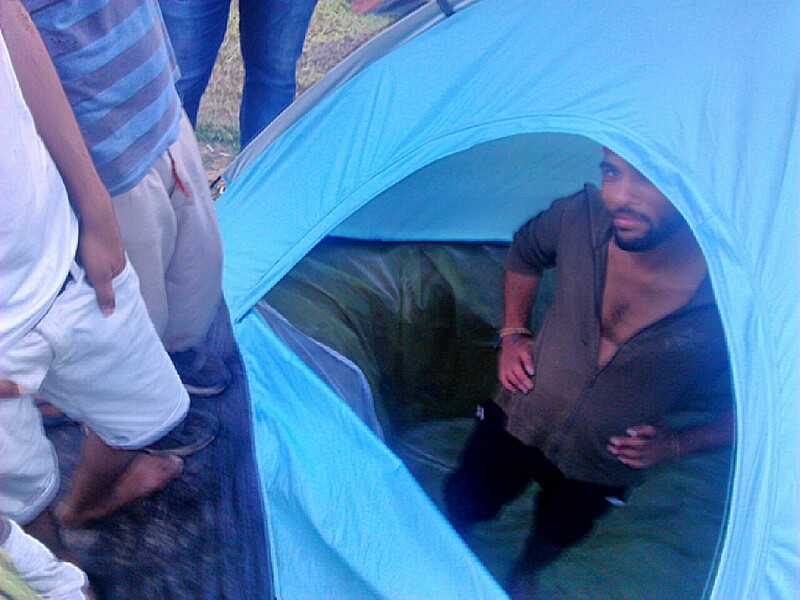 Alaa invited me to the far end of the camp to see his tent. I was nervous that we’d cross a guard or an official volunteer, but he assured me it was just refugees around. I thought that was strange. At the unofficial camp I’d visited near Athens, the volunteers were always around, playing with the kids, interpreting, answering demands. He gestured toward a large puddle of shimmering chemical-blue water near the portable toilets. 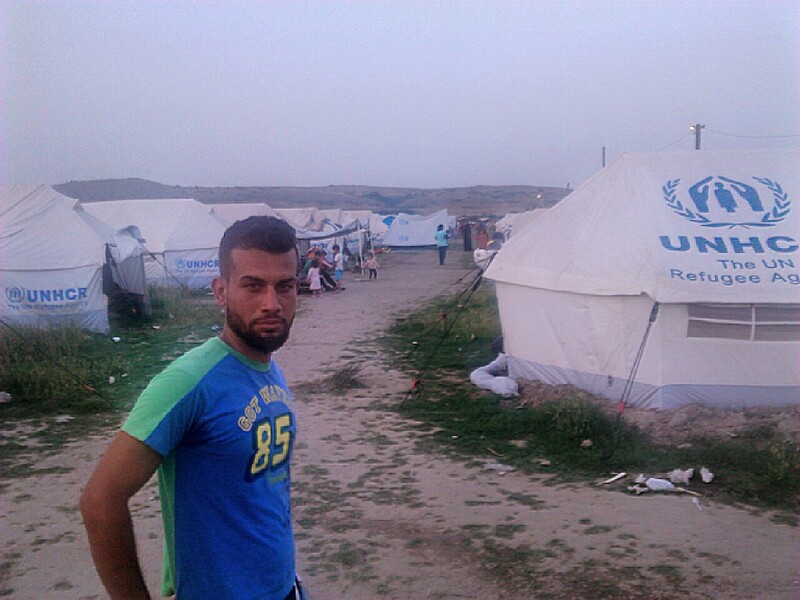 Resident Adi standing in front of a row of tents in the Nea Kavala refugee camp. His roommate was in the tent when we arrived, getting ready to eat. 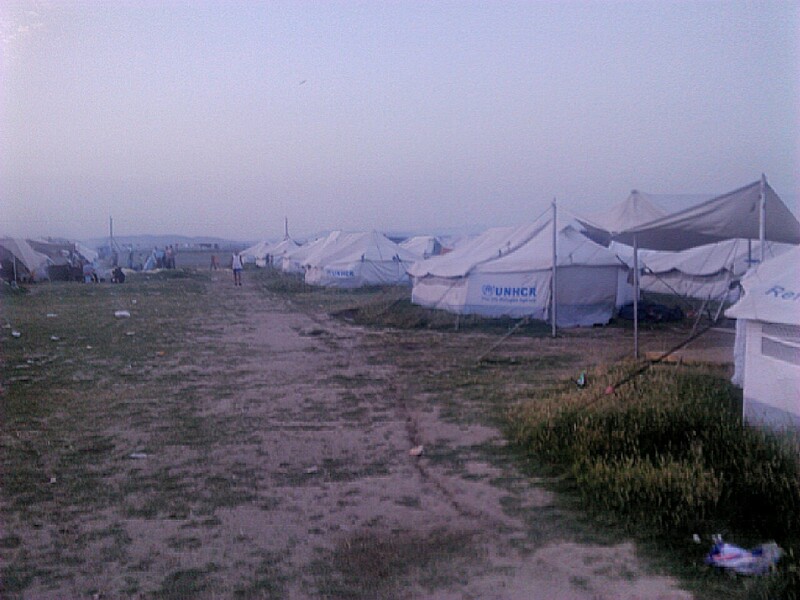 They had set up a department-store tent inside the UNHCR-issued tent as a sort of bedroom. The official tent doesn’t keep out the mosquitoes unless the flaps are closed, and then it becomes a sauna. “Greece. Has very good mosquitoes,” said Alaa, slapping his arm. We sat down to eat. Everyone took off their shoes, but I was wearing hightops so I just kept my legs outside of the entrance. Alaa’s roommate poored me a cup of orange juice. I took a sip and my eyes went big. It had fermented. “It’s good?” asked the roommate. He tried it and spit it out, then took the cup away from me apologetically. The military spaghetti had also spoiled. Smelled like feet. The rice and peas was basically a plastic container of rice with four green peas mixed in. It was slightly yellow, as if to suggest it had flavor. 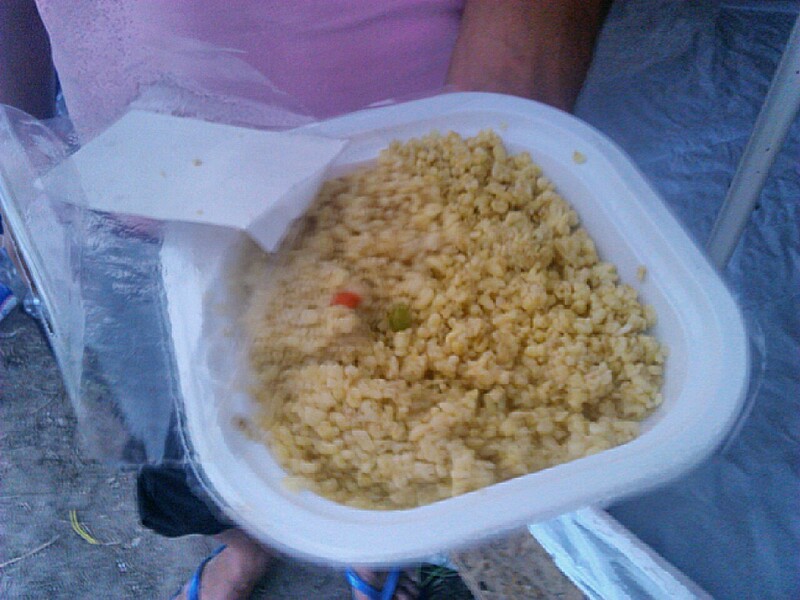 Rice pilaf, served almost every day at the camp. Not much pilaf. Not long into dinner a young boy came over with another container, a salad his mother had made with parsley from town. Alaa’s roommate pulled out some tomatoes and a can of tuna, also from town. Someone tried to cut the tomato with one of the plastic knives, and the knife snapped, sending a plastic shard flying. “Here, try this.” I handed him my pocket knife. “Ah, wow!” he said, smiling. We ate fast, slapping mosquitos in between bites. Alaa suggested we go outside to get away from the insects. It’s the first time I’d considered such a suggestion. He said he’d had a sports car in Syria, and he sold it to have money for the trip. Now he’s been stuck in Greece for four months and his cash is getting sopped up by tiny daily expenses. He’s consumed with the anxiety that his situation is slowly getting worse. Without money there’s not much he can do to get out of the camp except wait. In my whole life I have never heard anyone say they have nothing and mean it literally, not for dramatic effect. He has a phone, he has a change of clothes. True. But I’ve met people hiking the Appalachian trail with more worldly posessions. Some people have compared these military camps to prison camps. Of course they’re not the same thing. Alaa can go out and come back. He can walk four kilometers to the Park Hotel and spend two euros on a coffee. But that’s about it. He’s not interned, he’s just living in a world where outside the camp, he doesn’t exist. We strolled slowly down the runway where people had come out to talk, kick a soccer ball, congregate near the wi-fi router screwed to a telephone pole so that they could skype with people back home they haven’t seen in months, in years, some of them. “So you tell everyone about the bad life here?” asked Alaa. I knew he didn’t take me very seriously. My business card is printed on computer paper. But I am a man of my word. And here it is, his story, on my blog, getting 35 views a day, read on phones on trains, all across the world!